We have been in Largo for 13 weeks now, and I was starting to get “hitch itch” and wanted to make some sort of side trip with the RV. 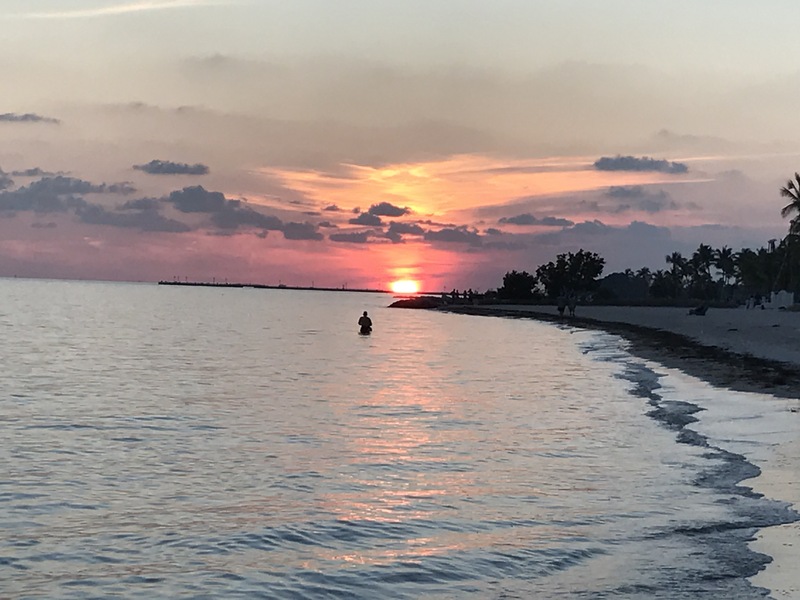 With the help of a coworker that traded some shifts around I got a 5-day block of days off and we quickly booked a campground reservation in the Keys. We had to do some quick preparations because we pulled out on this trip just 4 days after Heather’s family headed back to Ohio [and he worked 3 of those days!!! says Heather], so there was plenty to do in a short time period. On Thursday morning we hitched up and pulled out of the campground. Everything was going pretty well until a fellow motorist pulled up beside us and frantically pointed back toward our RV and began mouthing something to us. I could not understand what he was saying to us, but the pointing warranted a quick stop to check things out. I pulled off on the shoulder and as I came to a stop I saw a puff of smoke come from the passenger side tires. Since I lost an entire wheel between FL and TX last spring and never felt it, I was not sure what I would find when I rounded the front of the truck. What I found was that the rear wheel had apparently broken some cords along the middle of the tread line which gave the center of the tire a significant bulge all the way around the tire. Since the two axles sit very close together anyways, the bulging tire closed the small gap and had been rubbing on the front tire, creating heat and friction. Luckily the fellow motorist had noticed it fairly early and no major damage had been inflicted on the front tire. I pulled out my tools and in fairly quick time I had the spare on and the bulging tire secured under the trailer.Part way through the wheel swap a State Farm/FDOT Road Ranger truck arrived and set out cones and had lights flashing, which helped to move traffic over a lane, which reduced the trailer rocking every time a large truck went by us. The rest of the trip south went uneventfully, which we were thankful for as we no longer had a viable spare tire. We arrived at our campground shortly before the office closed and were pulled in and set up before nightfall. The grounds are nice and the people are friendly. There is a definite island theme around the campground. The low for the night was 72 degrees, so we enjoyed smelling the ocean through our open windows. The first full day in the Keys we headed for Key West. I had done some prior research and had a list of places I wanted to see and potential parking locations. 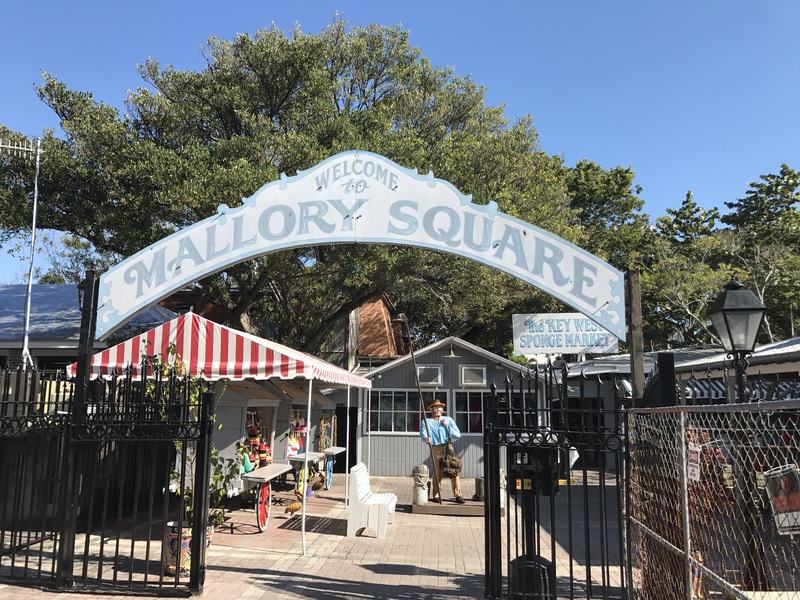 If you have not been to Key West before, parking can be very challenging downtown, and a decent part of the street parking is reserved for residents with permits. There are a few paid lots close to the cruise ship terminal, but we opted to park a little farther from downtown in a free parking spot along Smathers Beach. We took our bicycles with us, as well as our bicycle trailer for Miss Kicky Feet, and we were ready to explore. 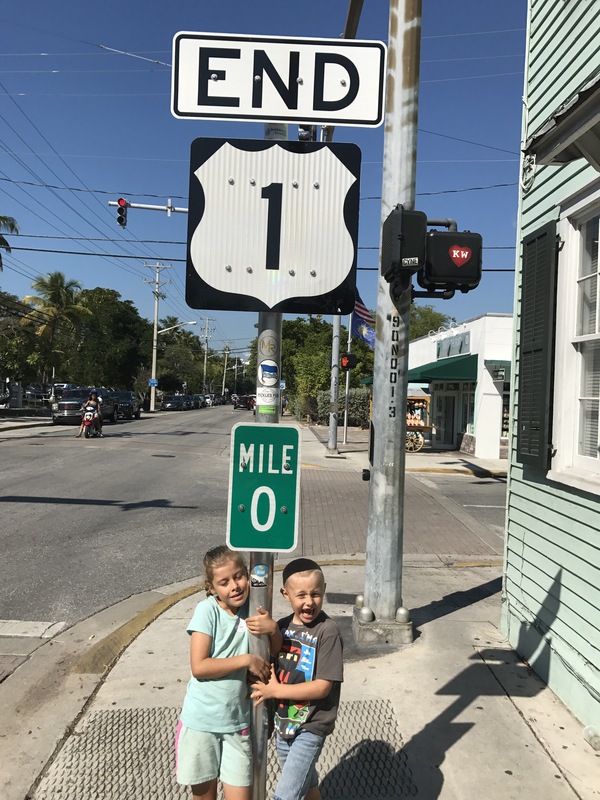 The kids have been riding without training wheels for a few years now, and since we have been doing up to 16 mile rides in Largo, the kids were more than prepared to traverse the 4 mile by 2 mile island without tiring out. 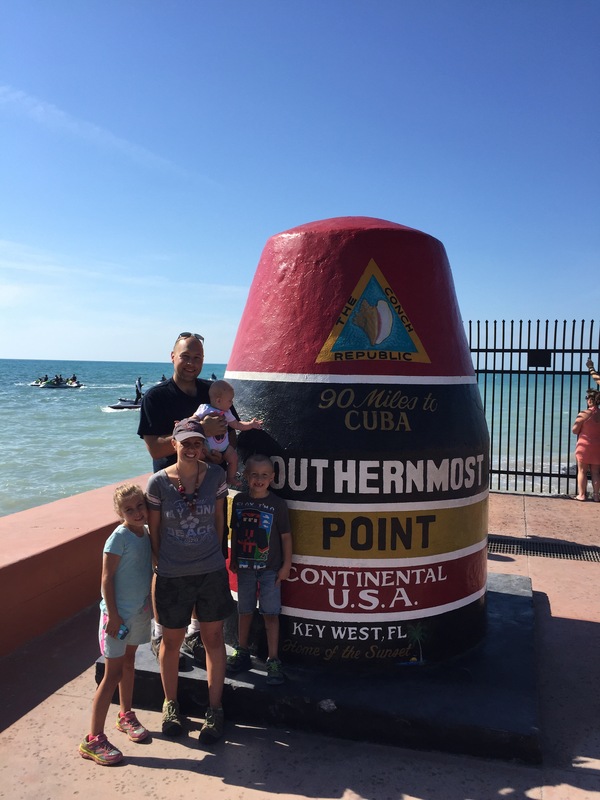 We took pictures at the Southernmost point as well as US-1 Mile Mark Zero. 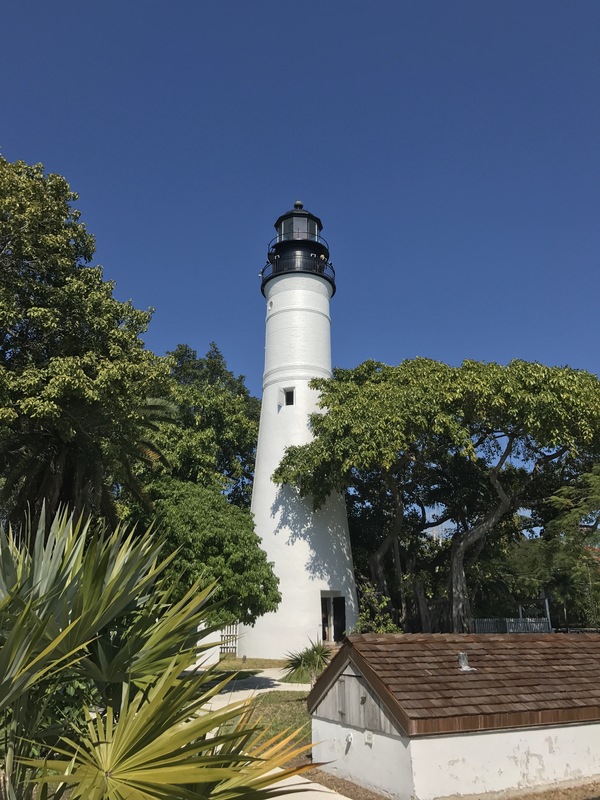 We explored the Key West Lighthouse and Keeper’s house and climbed the tower to grab some awesome panorama shots of the island. We ate lunch on the courthouse lawn, which we had packed in the back of the bike trailer. Side note: The bike trailer, which we purchased a number of years ago, has proved invaluable both in Largo as well as Key West, and we are glad it did not end up in the sell pile when we started traveling. It has become our base of operations for diaper duty, our packed lunches, and water.In Key West it also became the place to stash souvenirs. We love our bike trailer! 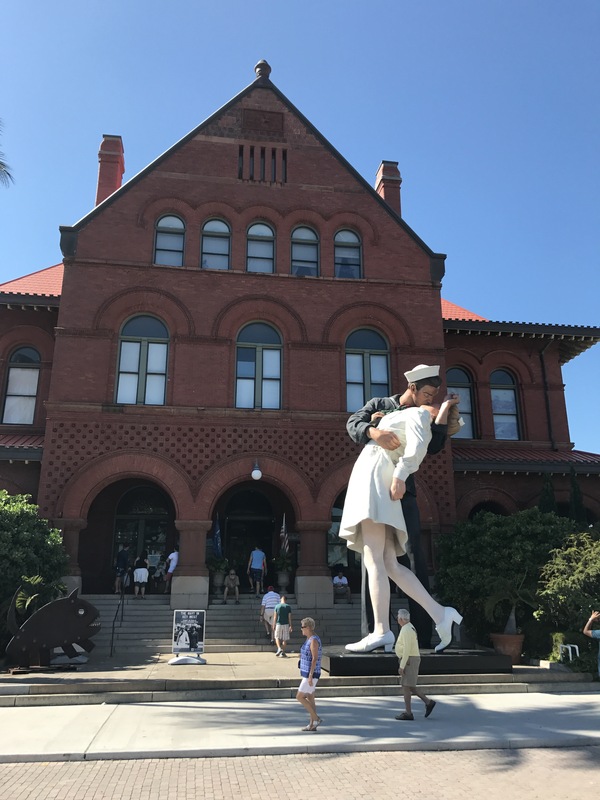 We learned about the role of the US Navy in Key West and Mr. Flagler’s railroad ventures at the Custom House. We walked around Mallory Square and the dockside shops. 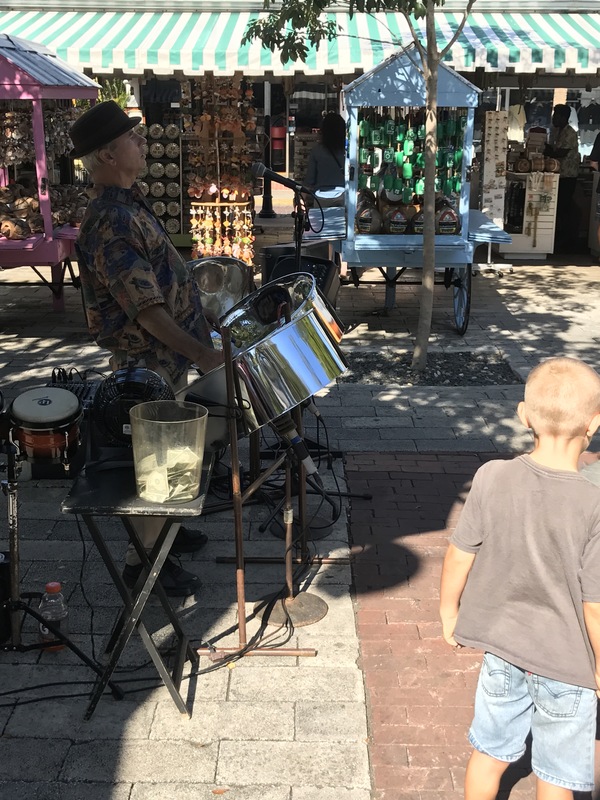 We listened to the sounds of steel drums as we walked around Mallory Square. 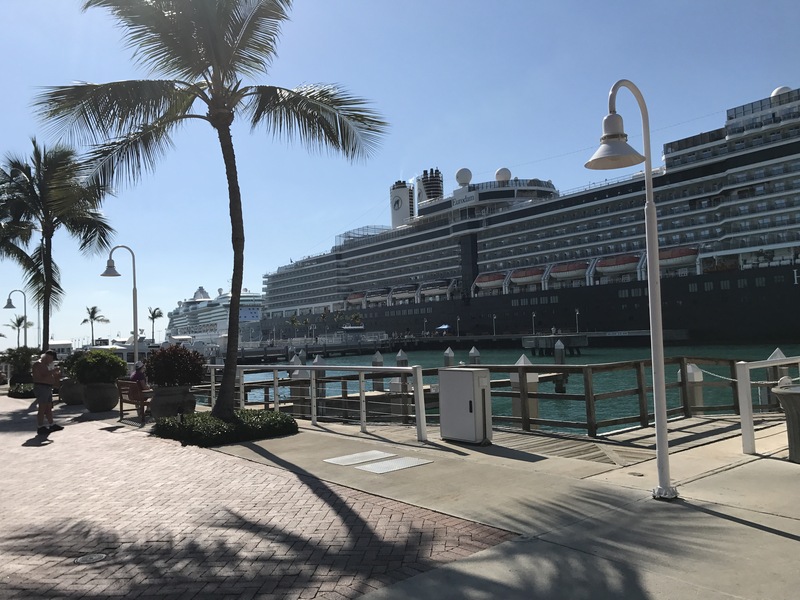 There were 3 cruise ships docked in Key West for the day, but even with the added influx of visitors, the city was not terribly crowded as I thought it may have been. We strolled down Duval street, and enjoyed some Key Lime pie as an afternoon snack. 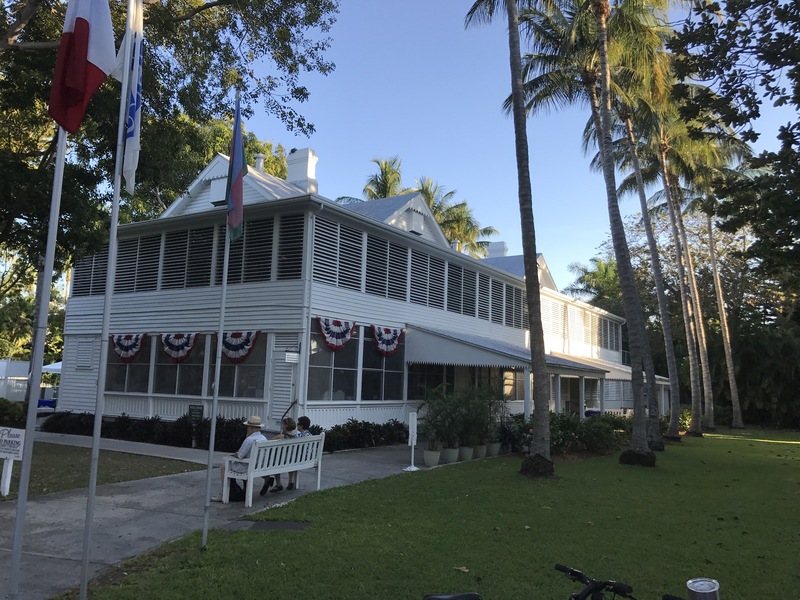 We stopped in at Jimmy Buffett’s Margaritaville and took the tour at the Harry S. Truman Little White House. The tour of the little white house was very interesting, and we can say that we have been in the house once occupied by the President of the United States and various global leaders. We finished the day on Key West with a stroll along Smathers beach with our toes in the white soft sand. We watched the sunset over the water from the beach, which was beautiful! 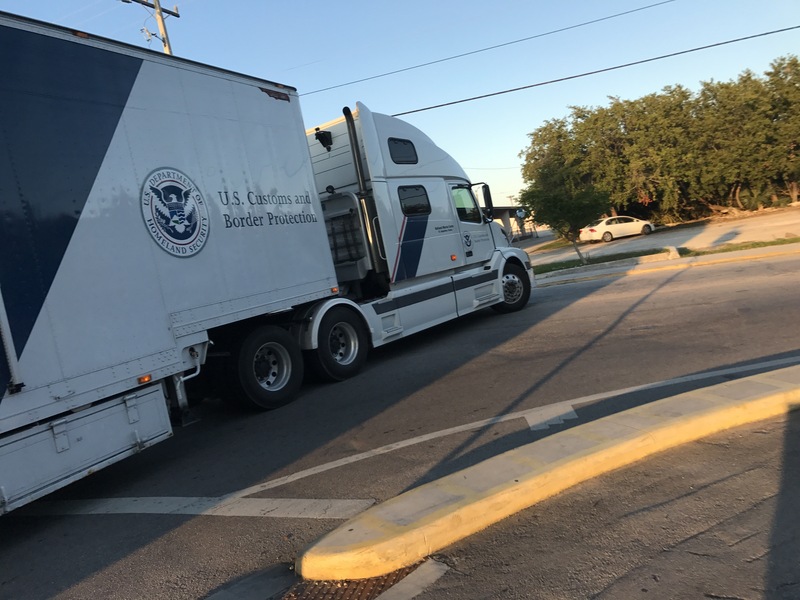 I did find it slightly funny that we came across a Border Patrol Semi truck on Key West…on the day Trump was being sworn in as our new President. Not sure which direction the border patrol was watching for, people coming or people going. Afterall, we were only 90 miles from Cuba . 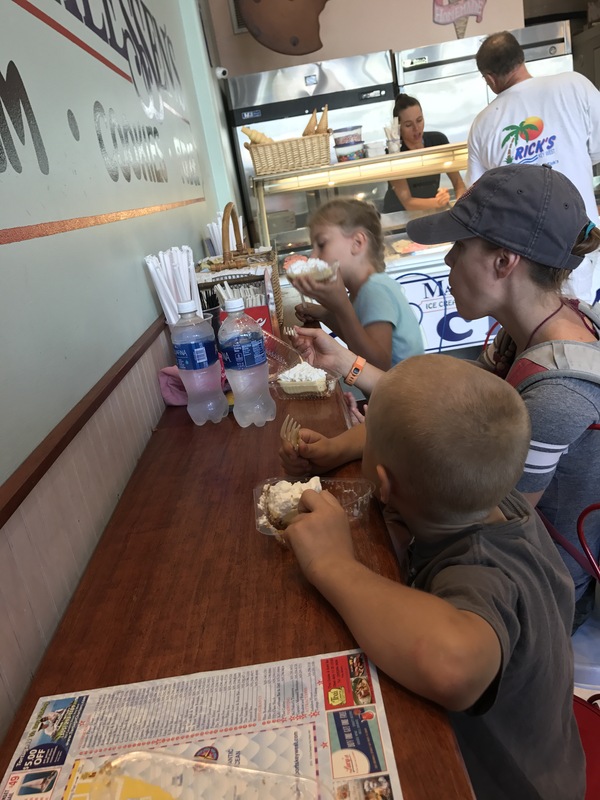 Once we left the island and headed back east we decided to stop for dinner instead of making it ourselves, so we stopped at a barbecue joint along US-1, which satisfied our ravenous appetites. Since this post is quite long as is, we will talk about the restof our Florida Keys trip in our next post. Happy Traveling! 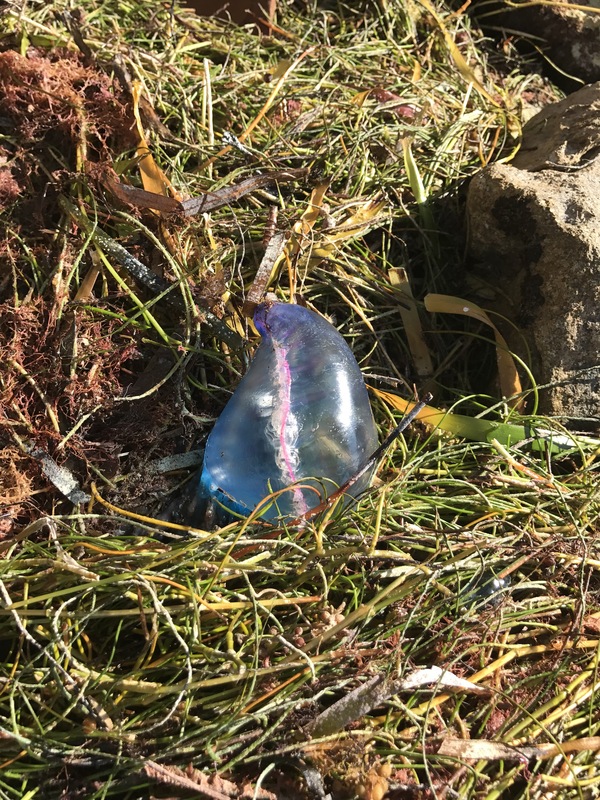 Thanks for the sighting report! Your comment has been moved to the Sightings page instead of the Key West post.